I often think about changing the name of this blog as my food intolerances have changed quite a bit since I started out, and thankfully, have made eating slightly less awkward. The main change has been my intolerance to gluten which at the beginning (it seemed to worsen at around age 20-21) made me go for various tests at the doctors and spend my evenings in bed with exhaustion/debilitating cramps. These days it just gives me constipation for a couple of days. As written before, I discovered this was the case when I went full gluten for 6 weeks so I could go for a coeliac disease test! So, it goes to prove that it's always worth testing the boundaries of your food intolerances if you have them. I was previously very intolerant to coffee, chocolate, bananas, lentils and beans and none of those things give me issues anymore. However new intolerances have appeared, including cucumber and oats (even the GF ones). After a bit of a pause from blogging, it seems appropriate that I jump back into the blogging game with a post on the same subject matter as my previous post! There's not much that gets me out of the house on a week night, but the tasting evenings at G&D are always worth a trip. They do put on a lovely spread. Meridian Korma Cooking Sauce - take the effort out of soaking cashews etc for a creamy curry sauce. This one tastes great, not artificial like some jar sauces and no one will know that it's vegan. We were recently invited to a tasting evening at GandD, an exclusively gluten and dairy free shop in south east Bristol. You know how excited us free frommers get at a free from event - we get to touch things, try things and get really nerdy about things without judgement. I was able to try everything on the 'gluten free and vegan' table while drinking some hot and chilled herbal tea. How very civilized! The guys running the shop are very lovely and happy for feedback. They just want to make the shop a useful outlet for people of all fussy diets - coeliacs and vegans alike. I think they've done rather well in the 6 months they've been open. It's definitely the best selection of brands I've seen, as well as of sundries, chilled and frozen in one place. 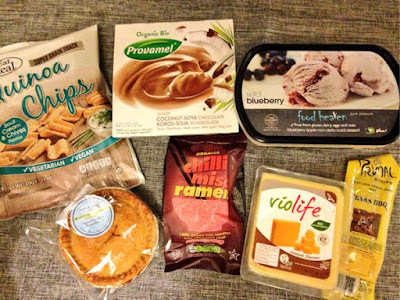 They have a particularly well stocked freezer with several types of dairy free ice cream and even the gluten and dairy free Amy's Mac & Cheese! Here lies my coeliac test story, of beige food, a blood test and temperamental bowels. Of thinking more about the food we buy, where we buy it and why we buy it. I have food intolerances and this means that I probably won't be intolerant to certain foods forever. Some intolerances linger for years, some go in a few months, sometimes it feels as though I'm intolerant to water. In September, after I got back from holiday and things had settled down a bit in my new job, I decided to go for a coliac disease test. The GP had finally agreed to test me back in April but it wasn't the right time. I wanted to rule it out once and for all. I argued that if I had a medical condition then I should know about it. If it was positive, I would stop doing damage to myself by being lazy about crumbs in the marge and the odd pot of KFC gravy. I was in a cafe with my husband and a friend of ours today. We all suffer from IBS and we were having a fairly open conversation about its joys, particularly how it affects us at work. Our friend said that he's left a room at work before, simply shouting "IBS!" behind him. 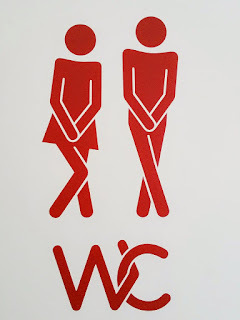 I responded that there should be a new rule - if you work with someone with IBS, under no circumstances should you stop them for a chat while they're on their way to the loo. Joking aside IBS at work is a serious issue and one which millions of us face. My survey gave me an interesting insight into the suffering of others. I kept it anonymous so I hope no-one minds me quoting them within this post. I asked for yes and no answers, but several people elaborated on their responses. Have you spoken to your manager or HR department about your IBS? Do you have private i.e. completely blocked in loos at work that you can use? Bored of brownies, meringues a little mundane? Check out new gluten free cake company 'Fusion Cakes and Bakes'. I attended their opening evening in a space on Bristol Harbourside (complete with gorgeous sunset, pictured above). I entered the space and was faced with a long table covered in free from cakes, bakes and loaves. Everything was available to try, you just needed to grab a knife or spoon and tuck in. Some of the products were both gluten and egg free, including Hazelnut & Chocolate Squares and the Rosemary & Orange Cake. I cut myself a few slices and sat down with an espresso. I can still taste the rosemary and orange cake now. I'm glad I finally got to try cake with rosemary as it's not something I would have made myself. It was very well balanced with a satisfying dense texture. Definitely the work of someone who knows their onions.